We will be back at the fun of the fete in the village of Harwell at this year's Harwell Feast where we will have a mega tombola and the Superheroes will be getting a soaking in the stocks to raise funds for local charities. Come along and enjoy our next charity ball on us at the Civic Hall in Didcot. After the success of our 10th Anniversary black-tie event, we are delighted to once again be hosting this glitzy event with a 3-course meal and entertainment included in a black-tie, masquerade themed night. Sleigh2Give - our annual Christmas appeal will return later this year for its fifth year. Each year our 'Sleigh2Give' drive just grows and grows. 2018 was our biggest campaign and the most amount of presents received, we hope to top this in 2019. We look forward to this year's appeal which launches later this year - keep an eye to this page! The Wheatsheaf pub in Didcot will be playing host to a festive fun extravaganza to raise money for Play2Give getting everyone into the Christmas spirit a few days before the big day. More information to follow. Join in at the Boundary Park for the 'Bands on the Boundary' festival - a weekend of family fun and bands where we will also be in attendance, raising awareness of and funds for Play2Give, and 'Selfies with the Superheroes'. P2G with AKS are joining forces to run our first ever joint Charity Golf Day to raise money for Oxfordshire charities with Play2Give. 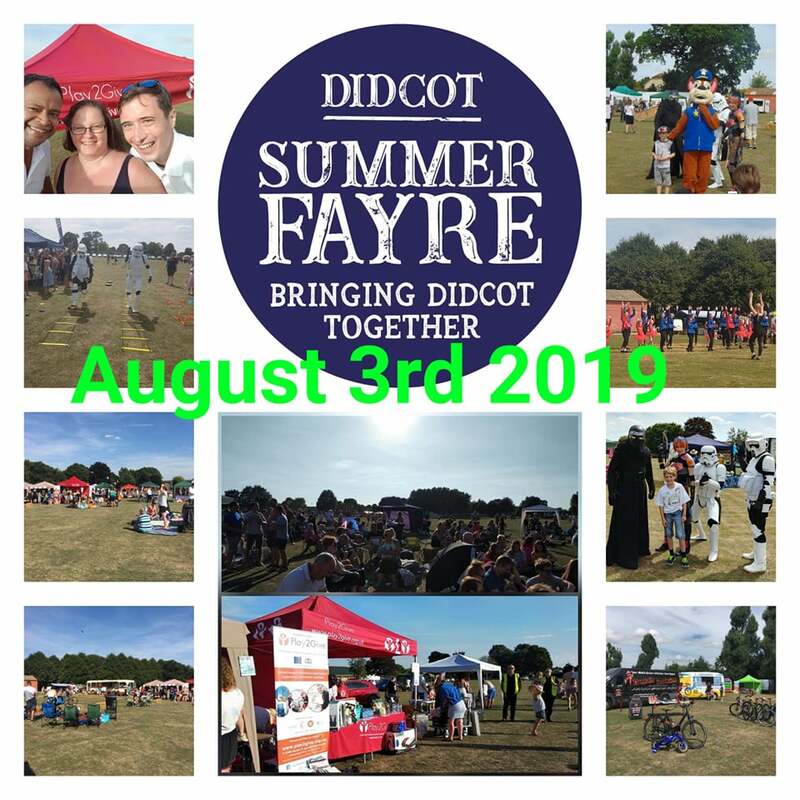 We are delighted to be selected to run Didcot's Summer Fayre for a second year bigger and better, which will be a fantastic family day for everyone. Join us for our spooky night of ghoulishly fun goings-on's at our Halloween-themed party at the fun setting of Partyman World of Play including Laser Kombat, with Halloween fancy dress if you dare. We will be back to raise money at this year's Didcot Street Fair - hoping this year the rain stays away - to raise money for our local charities with a tombola as well as action from the 'Superheroes' on the night. Thank you to everyone who takes part in and supports our events. ​You are welcome to arrange your own event, or take part in your own fundraising such as sponsored beardathons, runs, head shaves, marathons or raffles and more to raise funds.